July 1, 2015, 11:49 a.m.
By creating new products and taking advantage of its extensive archives, HBR’s plan is to both offer more to and ask more of subscribers. By Joseph Lichterman @ylichterman July 1, 2015, 11:49 a.m.
Harvard Business Review is trying to walk a fine line: The magazine thinks it can raise the price for a subscription and still attract close to 100,000 new subscribers. As of the end of 2014, HBR had a paid circulation (print plus digital) of 263,645, according to the Alliance for Audited Media. A yearlong U.S. subscription to the magazine, including access to its tablet edition, costs $99 annually. (It’s more expensive elsewhere.) The magazine increased its subscription price in 2013 from $89. Though the magazine says its paid circulation has grown by 17 percent since 2011, HBR now wants to boost its circulation to 350,000 — while also upping the subscription price again to $109. HBR thinks readers will be willing to pay more for a subscription because the magazine is adding new products it hopes will offer readers additional value for the added cost. Last month, HBR launched its Visual Library, a collection of the magazine’s charts, graphs, and slide decks accessible only to subscribers. It’s also in the early stages of testing out a concierge service that will allow users to request personalized collections of stories from the HBR archive. “What we found is that, as we’ve rolled these things out, we’ve been able to move the price up,” Macht said. The new products are part of a larger overhaul from HBR. Last fall, it introduced a redesigned website, and it’s currently in the midst of a print redesign — its first since 2010. And by the middle of 2016, HBR plans to roll out what editor-in-chief Adi Ignatius called “a pretty dramatic strategic rethink.” It’ll likely include more new products and a potential reduction in how often HBR comes out in print. HBR now prints 10 issues per year. The Visual Library debuted for all subscribers in early June after a nearly two-month-long soft launch. The library opened with about 100 charts and infographics and 11 pre-made PowerPoint presentations on topics such as “Navigating the Cultural Minefield” and “Reinventing Performance Management.” Why make your own deck for the quarterly TPS-report meeting when you can lift HBR’s? The slide decks went through nearly a year of development, said Eric Hellweg, HBR’s editorial director and managing director of digital strategy. The first slide deck HBR produced for the visual library was 96 slides long, but he said they’ve since shortened the decks and templated the process, making it easier for editors to produce them. “We’re trying to make it as easy as possible to provide the tools where possible so it’s not a heavy, heavy cognitive lift or time sink for editors,” Hellweg told me. Essentially, subscribers would request research on a certain topic and within 24 hours, HBR would provide a human-curated list of content that matches with the request. It’s still deciding whether it would be part of a normal subscription or if it would charge more for the service. Ignatius said the concierge service could play out in one of three ways: People aren’t interested in it and HBR would drop it; there’s a huge interest in the service, and HBR has to figure out how to meet demand; or there’s a perfect amount of interest and HBR can simply add it to a subscription. Regardless of what becomes of the concierge experiment, HBR, like many legacy news organizations, says its committed to making the most of its extensive archive, which dates back to the magazine’s founding in 1922. HBR has a big publishing business, and frequently publishes books and ebooks that are collections of reprinted HBR articles. But since its web redesign last fall, the magazine has begun thinking more actively about how to best use its archive. “The archive has gone from being something that’s just kind of there, and people bought reprints, to something we’re actively thinking about and working with,” Ignatius said. Subscribers have access to the magazine’s archives online, and both subscribers and users who are just registered with HBR can save any article to what HBR calls “My Library,” a personal dashboard to save and share stories. HBR will also recommend you stories based on what you say you’re interested in. But the magazine wants to further personalize its offerings, so if it knows, say, you’re the chief marketing officer of a large company, HBR will surface articles relevant to your work. For example, HBR has discovered that subscribers are the most likely cohort to go to the HBR homepage and use the site’s search function. As a result, HBR is going to prioritize improving search to benefit subscribers, Hellweg, the director of digital strategy, said. “Our fiscal year starts on July 1 [today], and we’re planning out a set of activities and we’re going to make sure that search is going to be as good as it can be, if that’s where subscribers are going. And we’re also going to try and find interesting ways that we can maybe make the newsletters more apparent to people and see if we can find ways to drive signups there, given some of that correlation,” he said. And though its recent redesign made HBR’s website responsive, subscribers are still primarily accessing the site on desktop — as you might imagine for an audience heavy on office dwellers with big screens. About 35 percent of HBR’s total traffic comes from mobile, but Hellweg said that when you only look at the most popular recent stories, about 60 percent of reading is on mobile — meaning that people reading the archives and using HBR’s other tools are even more concentrated on desktop. 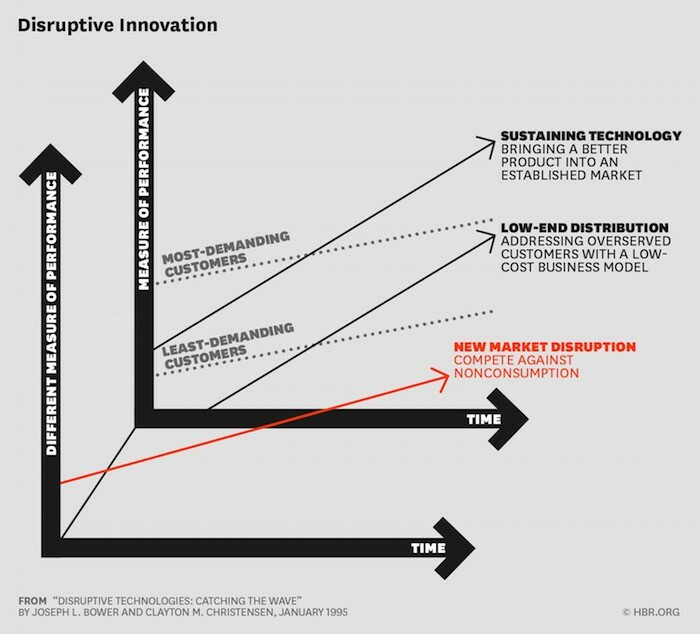 Chart — part of HBR’s Visual Library — illustrating disruptive innovation from 1995 HBR article by Clayton M. Christensen and Joseph L. Bower. POSTED July 1, 2015, 11:49 a.m.
Lichterman, Joseph. "Added value: How Harvard Business Review thinks it can add subscribers while getting more expensive." Nieman Journalism Lab. Nieman Foundation for Journalism at Harvard, 1 Jul. 2015. Web. 19 Apr. 2019. Lichterman, Joseph. "Added value: How Harvard Business Review thinks it can add subscribers while getting more expensive." Nieman Journalism Lab. Last modified July 1, 2015. Accessed April 19, 2019. https://www.niemanlab.org/2015/07/added-value-how-harvard-business-review-thinks-it-can-add-subscribers-while-getting-more-expensive/.